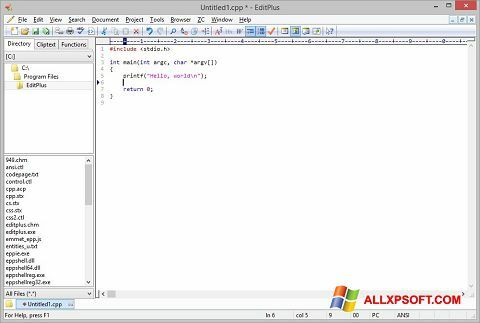 EditPlus for Windows XP - functional data editor with support for programming language syntax. The application uses a multi-window mode of operation, its own web browser for debugging written code, and is able to interact with the ftp protocol for editing files. The utility contains the possibility of numbering lines and hyphenation tool, allows you to highlight the syntax of most modern programming languages, understands the URL links and e-mail addresses. The program supports the technology Drag and Drop, allows you to assign shortcuts and generate custom toolbars. You can free download EditPlus official latest version for Windows XP in English.